Fireworks on Club Penguin for TWO reasons! Today is Canada Day! Yeah, that's right I knew that. And it will be July 4th Independence Day for the USA in a few days so let's celebrate with some Club Penguin fireworks. Oh yeah, the fireworks makes the shape of a Puffle too! Coolz. Thanks, Match87055. Ok, now that we got that out of the way, don't you think it's time Club Penguin does something new for Canada Day and July 4th? Still Pretty cool, but just sayin. Hey USA is only 3 days after Canada's! Did we copy them? I'm guessing it was on different years. What year did USA and Canada declare their independence? Oh so someone just told me today is NOT Canada's independence day. K, I'm confuzzled now. So what is Canada Day then? Club Penguin Mimo Contest and Chobots Winners! The Elite Penguin Force Command Room! Yeah, I know. I know. You don't have Elite Penguin Force. "Hey Mimo, that's no fair!" I know. But I told you it was hard. Congrats to the FIRST 50 wieners posted here. And the correct answer was hearing or listening! He got a free 6 month membership to Chobots! Cool huh?! Got any new CPG Mod suggestions? Club Penguin Now in Spanish! Do you remember when Club Penguin sold out to Disney? Do you remember why they said they wanted to sell? One of the reasons was so they could make Club Penguin in other languages! Well they added Spanish! Nice work Club penguin! Thanks, GptRules. Hey do you remember some of the other reasons they sold to Disney? I do. BTW, Disney is not interfering with Club Penguin. Club Penguin still makes their own decisions and make the game how they want. Disney is just helping them with money so they can do cool stuff. I think Disney has helped a lot! So leave a comment if you can tell me what Club Penguin has been able to do since Disney bought them! Oh, one more thing. Do you speak any spanish? I do. Hola! Club Penguin Where's Mimo Contest?! UPDATE! I'LL POST THE CORRECT ANSWER TOMORROW. Ok, here's a contest that's harder than it looks! 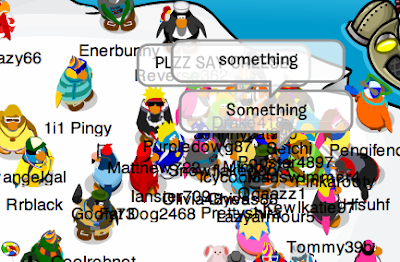 Simple: Where in Club Penguin am I? Leave a comment. I will post the first 50 correct Penguins! That's It! I know there were probably others but these are the first 50 I checked! Cool? Club Penguin Secret Ninja Hideout! Check it! Sensei sent everyone a cool secret message! You must be a Ninja to enter the hideout! Ok, this is very sweet! What do you think the move is? I think I know! 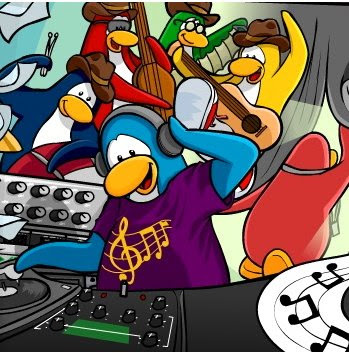 Club Penguin Releases DJ3K Music Update! The music update for the DJ3K is finally here. When you go to the game, you will see a catalog beside the game that you can buy which CD you want. When you buy a CD you can put it on your player card. Cool, huh? Thanks Ray Toolbear & Legoman098! Oh yeah, the your yellow Puffle can play with you now! "Club Penguin is Ready to Rock" Movie Trailer for G Force Movie! Here's a Club Penguin song called Ready To Rock by Steve Rushton. It's to promote the new Disney Movie that will be out July 24th called G-Force! It's about hamsters! Not sure if Carl is in the movie or not. Knowing him he probably is! Not really sure what this has to do with the movie. Weirdz. By the way, Miley Cyrus is dating the guy who wrote and sings this song. His name is Steve Rushton. New Club Penguin Igloo Upgrade Catalog Sweet O Cheats! Hey! It's been like a year since I did the full sweet cheats in the Club Penguin Igloo Upgrades Catalog! Yeah, they're kinda the same but hey. Check it out. Step 6. Click on the 7th page. Step 7. Click on the 4 "CANDY" words. NOW YOU HAVE THE GINGERBREAD HOUSE IGLOO! Step 8. Click on the 8th page. Step 9. Click on the igloo door. Yeah, I know. Same old stuff. Wouldn't it be cool if they had an underground igloo?! Filled with vanilla pudding? Don't forget to check out the new music and noisy thingys on the DJ3k! We have a Wiener of the Chobots Contest! UPDATE! I'LL POST THE WINNER TOMORROW. Ok we have one winner. But the winner did not leave their Chobots name. So if you guessed it correctly, email me the name you used when you left a comment, the correct answer again at info(at)mimo.cc. AND YOU WILL WIN A 6 MONTH FREE MEMBERSHIP TO CHOBOTS! Oh, and the winners name started with a "B". Hurry email me if you don't we will keep going until someone else gets it correct! AND FOR THE REST OF YOU, KEEP POSTING! Club Penguin has another "Reviewed by You" on their blog. This one is about the Music Jam '08. You can check it out here. I think the Music Jam would go great with peanut butter! How 'bout you? Win a Free 6 Month Membership to Chobots! Vayerman, creator of Chobots made a puzzle! He asked all Chobots to find out what this ancient sign means. Can you figure it out? If you can and you are the FIRST, YOU win a free 6 month memberhship to Chobots! "Is it a heart? Love? Feeling? Nope, according to ancient people. This symbol means action. Which action is it? You tell me! ;)"
Leave a comment and if you guess it, you will receive 6 months citizen pass on Chobots! Cool right? I'll give Vayerman your Chobots name and you will get the 6 month membership! By the way, if you have not been on Chobots in a while, they have made a BUNCH of cool upgrades! We will have a MAJOR party there soon. Because now you can fit a TON of ppl in one room! Like 200! If you haven't registered for your Chobots yet click here and get a FREE MIMO ITEM! Happy77 Talks About Club Penguin Music! 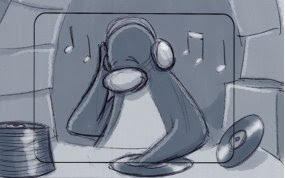 So, what kind of music do you wish was on Club Penguin island? Thanks Zxz192 & FishandFries! INSANE Club Penguin Idea Comment Contest! Ok, I got an idea! Why don't we suggest some new super cool ideas for Club Penguin! Then we can vote on the best ones. Then send them to Club Penguin with our penguin names on it?! BUT here's the deal! EVERYONE must send in an idea! That's right, we want to hear from all of you who NEVER leave a comment. Cool? So if you have NEVER left a comment, now you must! And if you are a first time comments just say "first Timer!" So go! Tell all your friends! Post a link to this article on your blogs! Email your cousins! Call your grandma! Tell the guy at Taco Bell! Text your enemies! We need to set a record for the most comments! The contest will end when we get 9,999 idea comments! This Friday will be the update for the DJ3K game! Do you play this game? Sorry I don't. Members will be able to buy music from a special catalog they can use for the game in the Night Club. That's actually pretty cool! I might do this! There will also be new music in your igloo! Saweet... well, if you are a member! Member, member, member, blah, blah, blah. 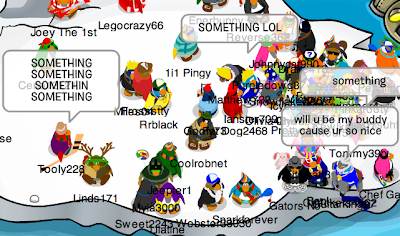 "SAY SOMETHING" Mimo Club Penguin Twitter Quickee Party ROCKED! 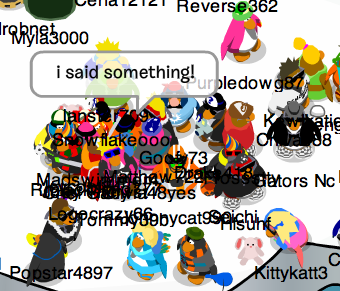 Yeah that's was quite a "SAY SOMETHING" Mimo Club Penguin Twitter Quickee Party! 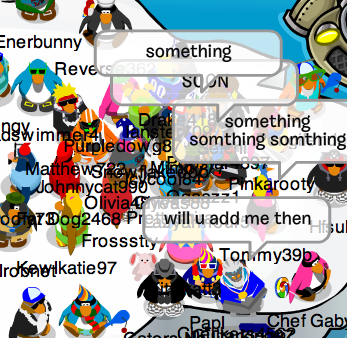 What is a "SAY SOMETHING" Mimo Club Penguin Twitter Quickee Party, you ask? 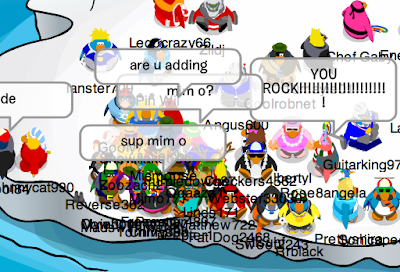 Well it just started out like any other Mimo Quickee Party on Club Penguin. I gave the server and room on my Twitter. Then when ever I am giving out postcards, someone always says, "Hey Mimo, say something!" So I said, "Something!" Then everyone started to say, "Something!" It was very phunnie! Next time when someone asks that, let's just have a "Say Something" party. If you missed it Better subscribe to my Twitter! Click here. Club Penguin Coming Events - Sneak Peeks! Whoa! Finally, I have some very cool Club Penguin information for you! First of all, Club Penguin has admitted there will be new rooms on the island! Saweet! We have all been suspicious of the extra monitor in the HQ, but now Club Penguin says there will be some construction in the near future with rooms and places! As you can see from the sneak peek, "The Ruby and the Ruby" will be returning at the Stage. And of course the "Massive Music Festival" (AKA, Music Jam) will be here soon! You will be able to meet the Penguin Band and maybe even Sensei! WOW! For members, there is going to be upgrades and music in DJ3K! But, what is that volcano looking picture? It is found on the island next to the Dojo. Is this where the new rooms will be? Any ideas? New Club Penguin Pin Cheat - WATERMELON PIN! The Return of Music Jam! Club Penguin 3 Month Membership! New Mission Mine Stuff? Nope! Club Penguin 101 Days of Fun Update! 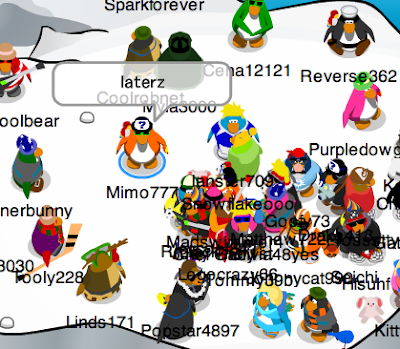 Club Penguin Mimo Party ROCKED! Club Penguin Pulll and Let Go Toys & New Puffles! Final Eulc to Mimo Club Penguin Party Clue! Club Penguin Series 3 Treasure Book Cheats FOUND! Club Penguin Umbrella Pin Wins & Other Stuff! Club Penguin Adventure Party Free Items Cheats! Club Penguin's Reviewed By You! One Year Free Membership Give Away! Club Penguin Summer Pin Choice! Club Penguin Announces Series 3 Toys! More 101 Days of Club Penguin Phun! New Club Penguin Toys Figures Series 3! Club Penguin Mimo Party Clue #3! New Club Penguin Pin Cheat - SAFARI HAT PIN! Mimo's Salad Makes The Club Penguin Newspaper! Help Pick the Next Club Penguin Pin! Club Penguin Clothing Sneak Peek Cheat & Salad! Club Penguin 101 Days of Fun!